For many people, hearing the name Margaret Court provokes thoughts of a tennis court and a great Australian sporting champion. For many LGBTI people, the name Margaret Court makes us think of a religious leader who has made unfounded, insulting and often ridiculous claims about our sexuality and families. 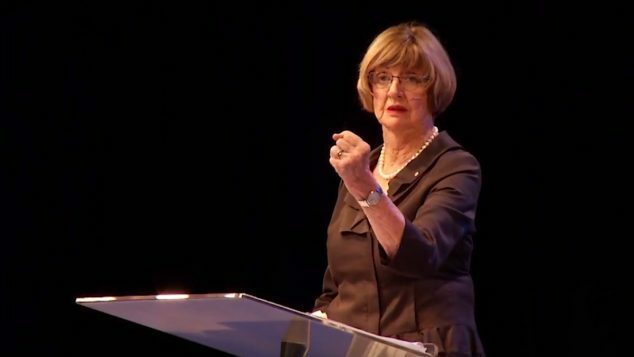 The calls for Melbourne’s Margaret Court Arena to be renamed are not because the leader of Perth’s Victory Life church wrote a letter to the newspaper saying she’d stop flying QANTAS because they support marriage equality. It’s because for decades she has made claims about LGBTI people that are insulting. Some say we should dismiss her statements as the ramblings of old lady, a bit of a fuddy-duddy who likes to go on about what is in the bible. That position ignores that reality that her church is a massive organisation that speaks to thousands of people on a weekly basis. When Margaret Court delivers her sermons she delivers falsehoods. Margaret Court is always saying how she loves all people and has nothing against gay people, while in the next breath declaring that most of us are the victims of sexual abuse, and our sexuality is the result of some sort of ‘thought virus’. Reverend Court has compared the Safe Schools anti-bullying program to communism. She’s attacked people’s individual families and questioned their parenting abilities. She’s dismissed the reality of gay men by saying, some men are just more effeminate. Concern has previously been raised about Victory Life being an organisation that promotes ex-gay therapy and claims that homosexuality can be cured. Margaret Court has claimed that he free speech is being curtailed, that he beliefs about who should be allowed to marry are not being listened to. Not for a second do I suggest that her thoughts should be omitted from the over-extended public debate on marriage equality. Far from it, we should listen to Margaret Court’s ramblings, for that is all that is left in the marriage equality debate. Yesterday Prime Minister Malcolm Turnbull said we should recognise Court’s great sporting achievements. Yes, we should. Her statistics were impressive. Her ever growing tally of attacks on LGBTI people is also weighty, and her decades of insults can not be ignored. As time goes on, it will be her latter religious and political career she is remembered for. When a person’s deeds and statements cast a shadow over their former achievements, it is appropriate to question the ongoing value of the accolades they have been lauded with. Deciding to remove someone’s name off a public building is not unheard of. In February, Yale University declared it would rename John C. Calhoun residential college because it’s name sake was a nineteenth century white supremacist. Melbourne University’s Richard Berry building was renamed because of Berry’s link to eugenics. Princeton University has rejected calls for it to rename building that honours former US President Woodrow Wilson, despite Wilson’s involvement in the Klu Klux Klan, but has vowed to more activities on campus to address racism. Current US President Donald Trump’s name has already been removed from several New York apartment buildings because their residents didn’t want to be associated with him. All mentions of Rolf Harris have rightly been removed from the streets of Perth, and drag queens have stopped performing The Court of King Caractacus. When LGBT hear the name Margaret Court Arena during a television broadcast they remember being told that their long standing and loving relationships are of lesser value. If a musician announces their Australian tour and they play Margaret Court Arena, for LGBTI people there’s a reminder in that moment, some people promote the belief that their sexuality is somehow the result of a crime. When a gay, lesbian, bisexual or transgender person, or their family members, walk into Margaret Court Arena, they don’t think of tennis. Graeme is a broadcaster, and the Managing Editor of OUTinPerth. Read more of his thoughts here.